Stevens Peak is an exceptional hike for adventurous people looking to challenge their physical stamina, weather forecasting, and land navigation skills. Throughout the journey you’ll be treated to stunning views of the south end of the Lake Tahoe Basin (and beyond in all directions). Since you’ll be trekking through Meiss Country, you’ll bear witness to panoramic views of Round Lake, Little Round Top and its ridge, Red Lake Peak, The Sisters, Round Top, Elephants Back, Hope Valley, Hawkins Peak, and further south into Alpine County. 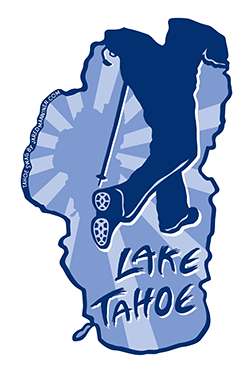 You’ll also catch some glimpses of Freel Peak and Jobs Sister, Lake Tahoe, and Desolation Wilderness. The trek to Stevens Peak is not for the faint of heart, however. This route features approximately seven miles of off-trail hiking and navigating across (mostly) open terrain. This means that you’ll be fully exposed if you get caught in inclement weather, injure yourself, or things go sideways in any one of a dozen different ways. For hiking the Stevens Peak Loop you need to be able to orient yourself when reading a topographical map. That said, if you’re new to hiking off-trail I would save this one for when you have more backcountry experience. Click on the above map to enlarge it for better viewing and printing. This map is only for reference and shows the general loop route to Stevens Peak from the Big Meadow Trailhead. Always carry a traditional topographic map and compass when traveling in the backcountry. Parking for the Stevens Peak Loop is located at the Big Meadow Trailhead (and campground) 5 miles south of the HWY 50/SR 89 intersection in Meyers, CA. Drive south of Meyers along SR 89 (and through Christmas Valley) until you reach the pronounced bend in the road. In less than a half mile you’ll find the entrance to the Big Meadow Campground and parking area. The entrance is on the north side of SR 89, so keep your eyes open because it’s easy to miss. And, be cautious when proceeding around this bend because the trail to Stevens Peak crosses SR 89. There’s a good chance you’ll encounter hikers and mountain bikers trying to cross the road at this location. The parking is free and plentiful, and near the entrance you’ll find pit toilets. However, the Big Meadow parking area serves many different people as it’s a trailhead to multiple other hiking trails, an official Tahoe Rim Trail trailhead, and is multi-use (i.e. hikers, mountain bikers, and horseback riders). So, you’ll be contending with many other people when looking for a parking spot. As always, your best bet to avoid the crowds is to hike this trail during the week and/or early in the morning. The trailhead for hiking the loop around Stevens Peak starts at the Big Meadow Trailhead. Here’s a map to help you find the entrance to the Big Meadow Trailhead and parking area. The loop hike to Stevens Peak begins at the Big Meadow Trailhead. Hike from the parking lot across SR 89 (use caution, obviously) and up the trail for approximately .6 miles to a signpost that indicates Big Meadow or Scott’s Lake. This signpost is the beginning/ending of the Stevens Peak Loop. From this point, you need to decide whether you’re going to hike in a clockwise or counterclockwise direction. Neither direction is right or wrong or better or worse. However, hiking in a clockwise direction seems more logical so I’ll provide those directions first. Hike the established trail to Scott’s Lake for about 2.5 miles, but don’t actually hike all the way to Scott’s Lake. You want to be at a location somewhere beneath Waterhouse Peak. Once you’re there, head off-trail in a south-southwest direction (away from Waterhouse Peak). While traveling through the forest, weave your way between the isolated ridge that parallels the Scott’s Lake Trail and the zig-zag ridge that’s located southwest of Scott’s Lake. You’ll know you’re traveling in the right direction if, at around .5 miles, you cross the small creek that flows into Scott’s Lake. Continue hiking uphill and in a south-southwest direction until you reach a pronounced “T” intersection along the zig-zag ridge. Once you gain the ridge at this intersection, you should see Stevens Peak due south. Navigating to Stevens Peak should be pretty obvious at this point if you’re hiking on a clear day. Nevertheless, hike south along the ridge for approximately 1.25 miles and then veer southeast along the even higher ridge (connected with the one you’ve just hiked). Stevens Peak is the highest point along the rocky ridgetop above you. There should be an ammo can at the top with trail registers contained within. Please note that on the map I’ve indicated a relatively direct line between the Scott’s Lake Trail and the “T” intersection on the ridge. However, you could choose to hike more directly up to the zig-zag ridge and follow it until you reach the “T” intersection (see the Alternate Routes labeled on the map). Either way is fine. On the day I recorded this hike it was late in October and the sun was already beginning to set, so I simply wanted to travel more directly to the Scott’s Lake Trail (as I was hiking counterclockwise). The return hike to the Big Meadow trail (to complete the Stevens Peak Loop) requires you to backtrack along the higher ridge until you reach the north/south running ridge which you originally hiked. At this junction, however, hike northwest for about .75 miles. Toward the end of this short section, you’ll note a steep drop-off to the west. Contour the ridge until you begin to veer north. Then, you’ll essentially continue traveling north for the remainder of the off-trail portion of the Stevens Peak Loop (until you reach the Big Meadow Trail). I highly discourage you from stepping too close to the edge along this northward section as it’s comprised mostly of decomposing granite and volcanic rock (which can be crumbly). There’s plenty of flat terrain along this section, so as long as you don’t creep too close to the edge you don’t need to be concerned for falling. Just be conservative when traveling here so that you can live to tell about your adventure. Again, when I recorded the route featured on the above map I was hiking in a counterclockwise direction. So, I had elected to hike up a draw just off of the Big Meadow Trail to gain the ridge. However, I wouldn’t concern yourself too much with following this exact route back to the trail. It would be simpler to just keep following the edge of the ridge downhill in order to link up with the Big Meadow Trail (see the Alternate Route labeled on the map). Once you reach the Big Meadow Trail, follow it all the way back to the Big Meadow Trailhead and parking area. From the Big Meadow/Scott’s Lake signpost, travel approximately 1.5 miles along the Big Meadow Trail. At around 2 total miles, you’ll see a creek surrounded by grasses and willow. At any point in this area you can begin to hike off-trail in a southward and uphill direction. However, I recommend hiking a little further along the Big Meadow Trail. This trail eventually leads to Round Lake, but before doing so it travels downhill along an obvious switchback. Stay on the trail until it takes a definitive turn to the northwest and begins to descend. From this “corner” you can head primarily south, contouring the edge of the terrain (see the Alternate Route labeled on the map). Obviously, take care while tracing a line along this edge as much of the terrain is composed of crumbly volcanic rock and decomposing granite. However, there is plenty of flat terrain to walk along this route and it’s very easy to follow because of its defined boundary. While following the western edge of the Stevens Peak Loop you’ll travel in and out of some wooded areas, but they will be brief. Stay as (safely) far west as you can and you won’t have any problems navigating through these areas. At around the 4-mile mark, you’ll need to veer in a southeast direction. For all intents and purposes you’ll run out of ridge to the south, so just keep tracing the line along the ridge and in the (southeast) direction of Stevens Peak. You’ll reach the peak in about 1.25 more miles. Stevens Peak is the highest point along a brief rocky ridge and there should be an ammo can containing trail registers at the top. To complete the loop, backtrack about .5 miles down the ridge until you reach another ridge that runs north/south. Head north along this ridge for about 1.25 miles. You’ll reach a “T” intersection on this ridge, at which point you can start heading in a north-northeast direction. You’ll begin to descend the ridge and into the forest, but as long as you continue traveling in that north-northeast direction, you’ll eventually connect with the Scott’s Lake Trail. Use Waterhouse Peak as a landmark in which to guide you. Or, at the “T” intersection you could elect to continue hiking along the zig-zag ridge that leads in the direction of Scott’s Lake. Either way is fine, just know that there is no reason to hike up and over the isolated ridge that parallels the Scott’s Lake Trail (north of the zig-zag ridge). Once you reach the Scott’s Lake Trail, continue hiking along it all the way back to the Big Meadow Trailhead and parking area. Be mindful of your steps when hiking along any of the cliffs due to tripping and slipping hazards, as well as the fact that the terrain is primarily composed of unpredictable volcanic rock and decomposing granite. Whenever you hike off-trail do everything possible to minimize your impact on the land. Mostly this means leaving all natural features alone (i.e. don’t roll, topple, or throw rocks and other naturally occurring structural features), avoiding trampling over delicate vegetation, and not harassing or otherwise tempting (by feeding) wildlife. Without question you could hike a dozen and one different routes directly to Stevens Peak from the Big Meadow Trailhead. However, “the longest way round is the shortest way home.” The loop route I feature in this article affords the best views and the easiest terrain of which to navigate. Since this is a relatively remote and slower hike (due to the fact that more than half is off-trail), you could turn it into a fantastic overnight backpacking trip. If you do, however, be sure to check the forecast because there is nowhere to hide once you’re above the trees. On the ridge that runs north and south (just north of Stevens Peak) you’ll find a memorial site with a granite plaque featuring the name of a 12-year old boy named Kenny Miller. This child suffered at the age of two from a near-death case of meningitis. As a result, he didn’t develop mentally beyond that of a 4-year old. He was reportedly very active to the point where he found it challenging to physically stop moving. So his parents, instead of trying to keep him isolated within a building (home or school), provided him with as much natural stimulus as possible (i.e. going outside to play). They purchased a condo at Lake Tahoe and often went hiking and backpacking. The day that Kenny Miller went missing he and his family were hiking along the Pacific Crest Trail. 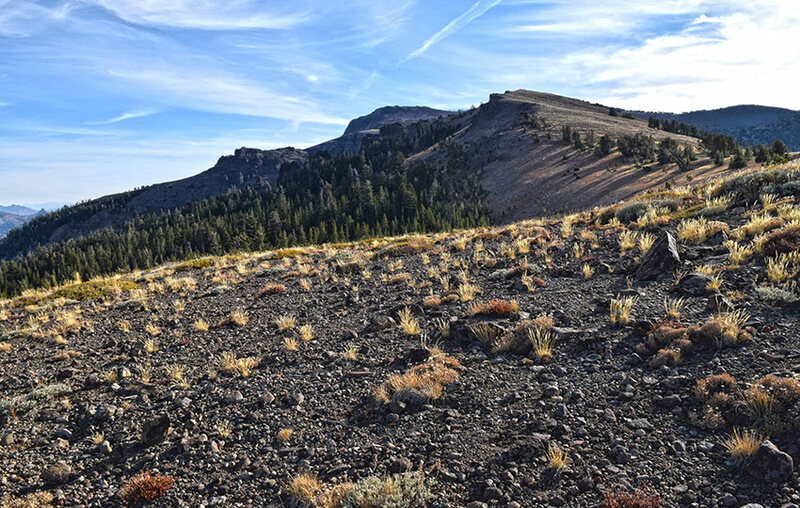 While his parents were taking a closer look at the ranch structures near the intersection of the Pacific Crest Trail and Tahoe Rim Trail in Meiss Meadow, Kenny wandered off. Although they hadn’t left him alone for more than a couple of minutes, Kenny had disappeared. That was June 23, 1992. In spite of extensive search and rescue efforts, his body wasn’t recovered until July 4, 1992, on a ridge 2.5 miles away. I cannot confirm whether or not the ridge on which his memorial now rests is the same ridge on which he was found. Stevens Peak is a favorite among backcountry skiers, but they primarily access it via Carson Pass since the Big Meadow Trailhead is closed during the winter and the approach from this side would take forever. For advanced backcountry travelers using alpine gear such as Randonee, Alpine Touring, Telemark, split boards, and snowboards, look elsewhere for information about backcountry skiing down Stevens Peak. This is not my forte, and there are other websites that can provide this type of information.